This article is a short summary of Super Mario Land 2: 6 Golden Coins. 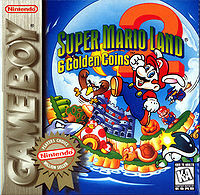 Super Mario Land 2: 6 Golden Coins is a 2D platformer in which the player takes control of Mario. It was developed and published by Nintendo for the Game Boy handheld system in 1992 and later released for the Nintendo 3DS Virtual Console in 2011. It is the sequel to Super Mario Land and features the first appearance of Wario, who would later go on to appear in several Mario games and even spawn his own series. "The wicked impostor Wario has cast an evil spell on Mario Land. It's the most challenging and dangerous Game Boy adventure yet." Temper-tantrum tyrant seizes Mario Land! In his greatest Game Boy™ adventure, Mario™ faces off against his evil rival Wario™, who has captured Mario Land and turned it into his private playground. To toss Wario off his ill-gotten throne, Mario must search new worlds for the six golden coins that unlock the gate to Mario’s castle. A mob of monsters, old and new, seek to stop him. Along the way, through six zones, Mario can nab Power Mushrooms, Super Stars and Fire Flowers for extra power. And if he eats the Magic Carrot, he’ll turn into a high-flying hare. To toss Wario off his ill-gotten throne, Mario must search new worlds for the six golden coins that unlock the gate to Mario’s castle. A mob of monsters, old and new, seek to stop him. Along the way, through six zones, Mario can nab Power Mushrooms, Super Stars and Fire Flowers for extra power. And if he eats the Magic Carrot, he’ll turn into a high-flying hare! In his greatest Game Boy adventure, Mario faces off against his evil rival Wario, who has captured Mario Land and turned it into his private playground. To toss Wario off his ill-gotten throne, Mario must search new worlds for the six golden coins that unlock the gate to Mario’s castle. A mob of monsters, old and new, seek to stop him. Along the way, through six zones, Mario can nab Power Mushrooms, Super Stars and Fire Flowers for extra power. And if he eats the Magic Carrot, he’ll turn into a high-flying hare! After the events of Super Mario Land, Mario returns home to Mario Land only to find that his jealous rival Wario has taken over Mario Land. Wario has brainwashed the inhabitants of Mario Land and scattered the keys to the castle, the 6 Golden Coins, across the land, giving them to some of his servants. Mario must get the 6 Golden Coins to gain entrance back into his castle in order to confront Wario and reclaim Mario Land. The gameplay essentially involves Mario jumping his way to the end of each level in order to obtain the Golden Coins. This is performed by the player moving Mario around the map of Mario Land allowing him to go to different zones such as the Tree Zone, the Macro Zone, the Pumpkin Zone, the Mario Zone, the Turtle Zone and the Space Zone. Each of the zones can be accessed in a non linear fashion, however the levels within each zone must be defeated in the more traditional linear sense. Mario will also encounter traditional enemies from Super Mario Bros. such as Goombas and Koopa Troopas, but Super Mario Land 2: 6 Golden Coins introduces new enemies as well like Grubbies and Jumping Jacks. Along his journey Mario will also find powerups from his past adventures such as the Super Mushroom, the Fire Flower and the Starman. The game also introduces the Carrot which transforms Mario into Bunny Mario, thus allowing him to hover down from jumps by rapidly flapping his bunny like ears. Coins also appear but instead of providing Mario 1-Ups they serve as currency for a minigame that gives the player a chance to earn 1-Ups, Fire Flowers and Carrots. Super Mario Land 2: 6 Golden Coins Nintendo 3DS (Virtual Console) 2011 A direct port of Super Mario Land 2. This page was last edited on 18 April 2016, at 01:43.